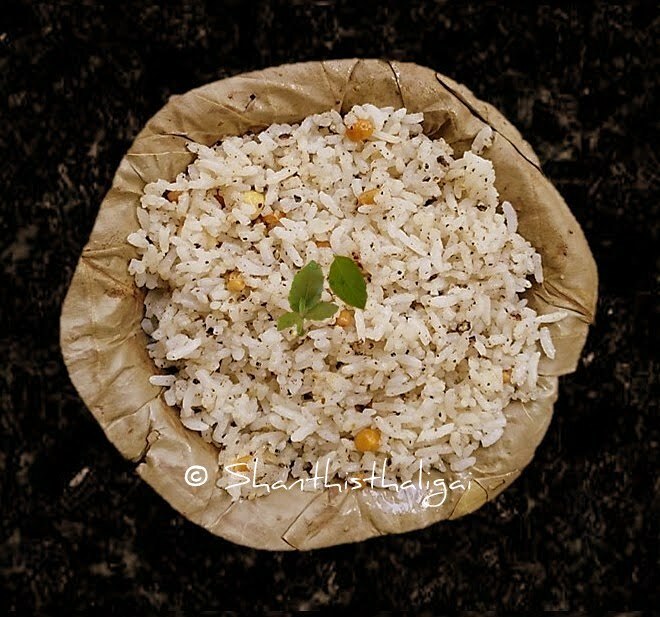 Milagorai is a zesty, Iyengar special rice recipe, served as a prasadam in Perumal kovil (temple) and mutts. It is very good for digestion. A spicy rice, easy and simple to make. We call mixed rice varieties like this as kalandha sadham or chitrannam. In an Iyengar household, any food made is offered to Perumal alongwith 'tulasi' and also the food should not be tasted while cooking. Everything cooked is partaken as 'Prasadam'. Black pepper - 2 tsp. Bengal gram (kadalai paruppu) - 1 tsp. Melted ghee - 2 tsp. NOTE: Raw rice should be used. Cook rice in such a way that the grains are separate and not sticky. Heat oil in a pan, add bengal gram, urad dhal and fry until golden brown, now add chilly and pepper. When it crackles, switch off the stove and transfer to a plate. When cool, powder coarsely. Spread cooked rice in a plate, add the powder, salt, ghee and a spoon of gingelly oil. Temper with the given ingredients. Mix gently without breaking the grains. Milagorai is ready. Serve with fried appalam or vadam. Mutt style: Only black pepper is fried in ghee and powdered coarsely. This is mixed to cooked rice alongwith ghee, salt and fried cashews.